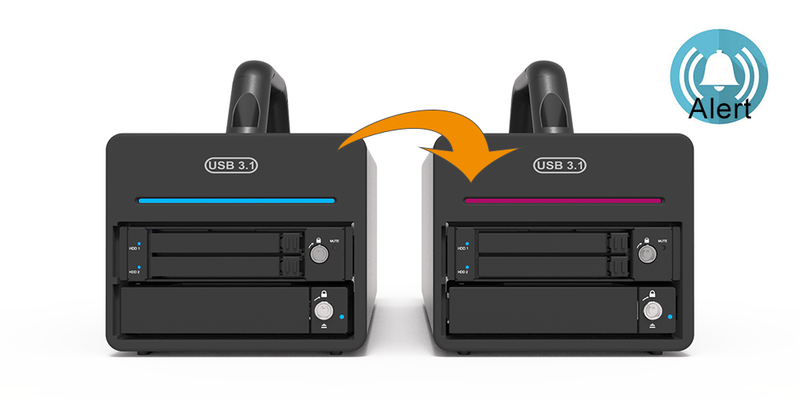 1) Support USB3.1 Gen 2 Protocol (10Gbps) together with Type-C connector. 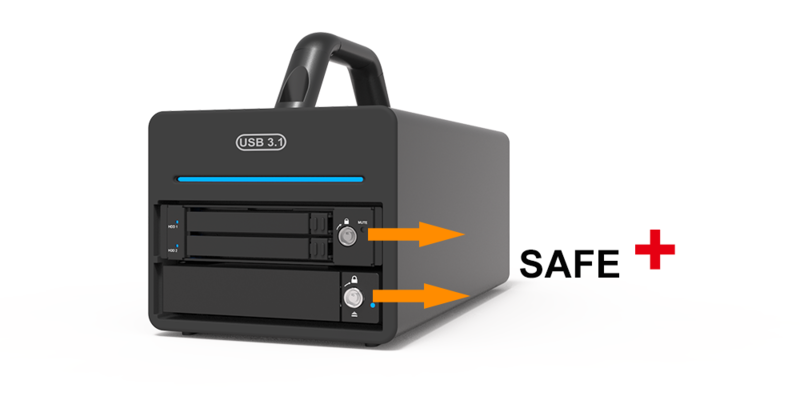 2) Support 2+1 bays, mainly for you to use both of high-speed 2.5" SSD for efficiency and high-capacity 3.5" HDD for mass storage space. 3) Support the 2 2.5" bay with RAID 1 mode for data protection during writings, and the 1 3.5" bay for huge data storage capacity. 5) Help data protection in case if anyone of the two 2.5" SSDs/HDDs is defect. 6) Support in-chassis overheat temperature monitoring and warning feature. 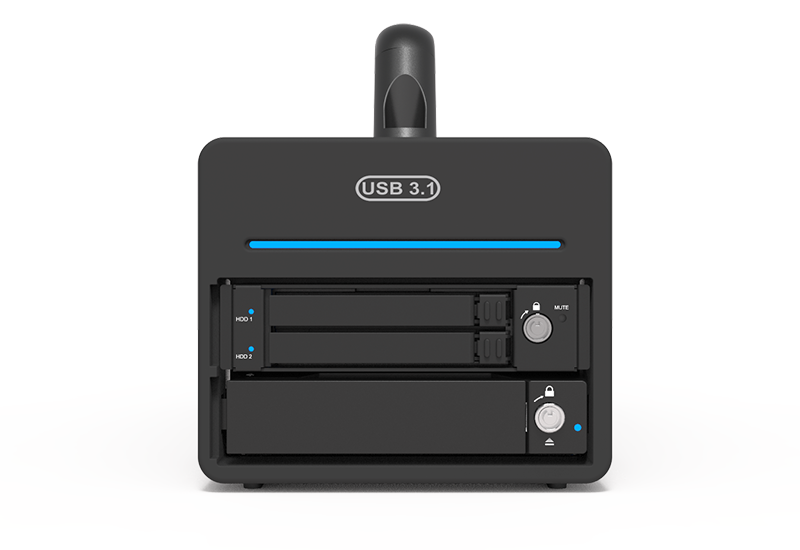 The DR3-B31 supports USB3.1 Gen 2 Protocol together with JBOD/RAID 1 storage modes which gives you an up to 10Gbps speed and a valuable storage mode choices. 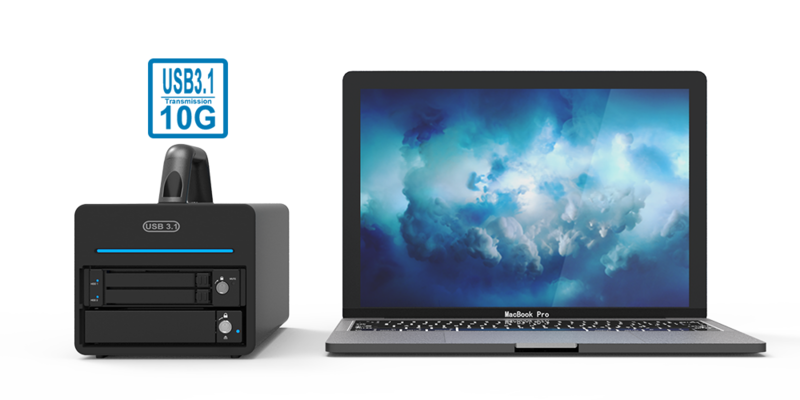 You could easily use it for searching data and editing your huge photo galleries directly from your Macbook Pro (USB-C) from its easy and friendly to use features. 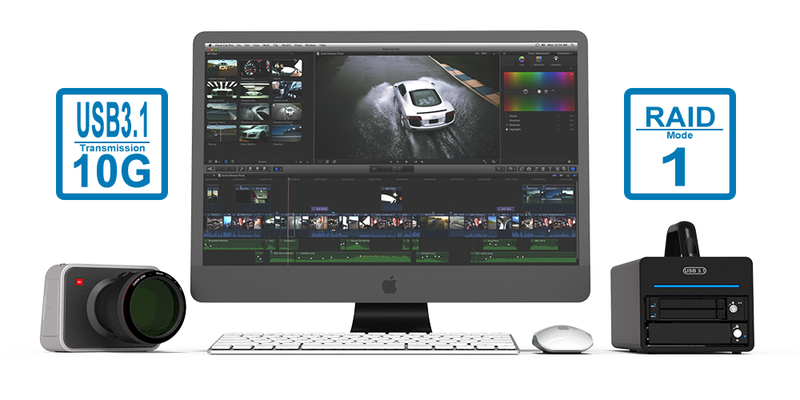 And also, you could definitely edit the 4K high resolution videos with no any uncomfortable delay. 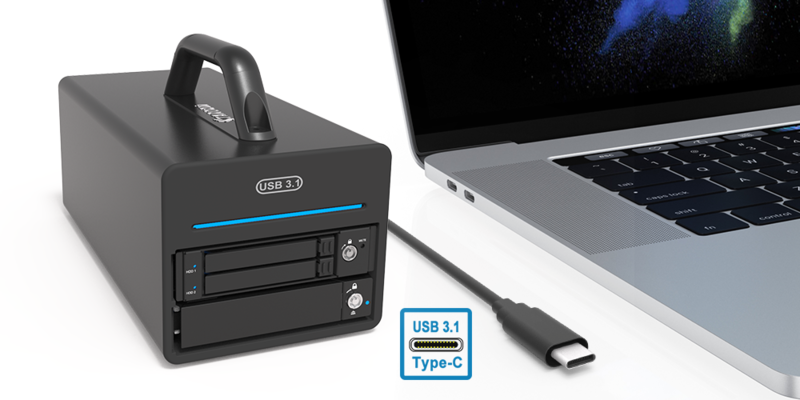 Our new DR3-B31 supports the USB Type-C connector which is compliant to that of Thunderbolt 3's, and you could directly connect it from any TB3 port at your new MacBook Pro. That means that you could easily connect them together without caring its cable direction. 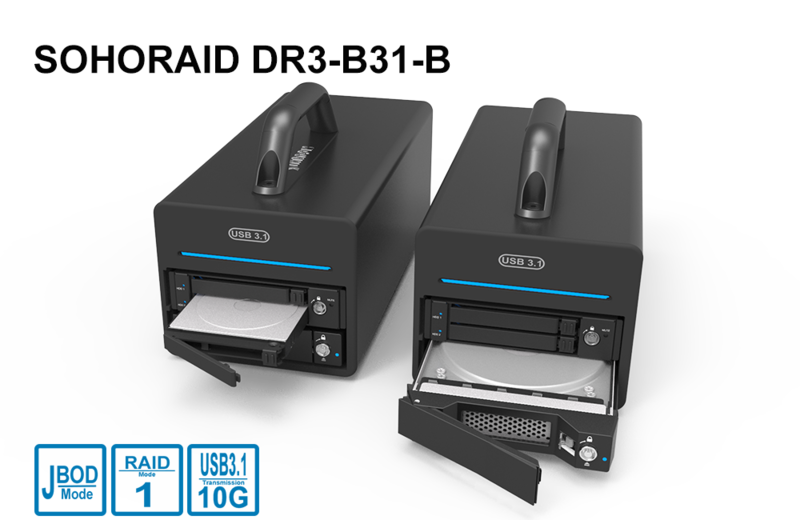 You could use either of the HDD and SSD or even both of HDD and SSD with your new DR3-B31 product from its RAID 1 + JBOD mixed modes setting. And you could have the variable choices for your different applications. Its rigid aluminum excluded chassis for the 3-bay storage solution is a perfect product for your professional use. 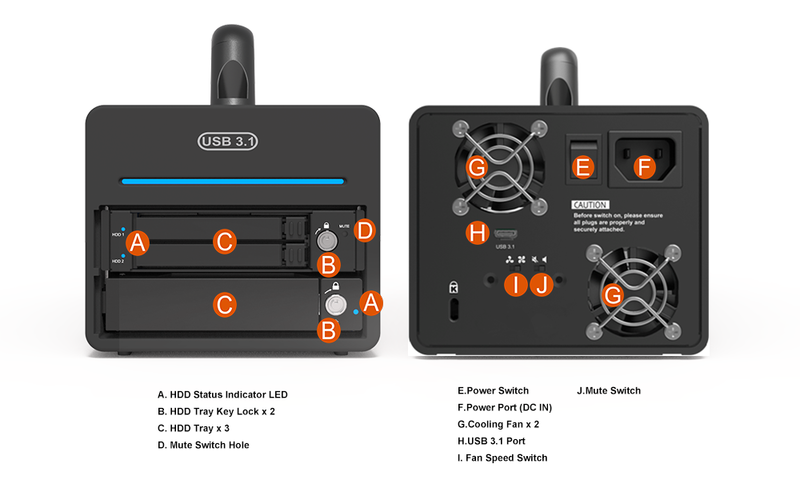 DR3-B31's single 3.5" bay (JBOD mode) is to provide you a good transportability and the easy memory expansion features. 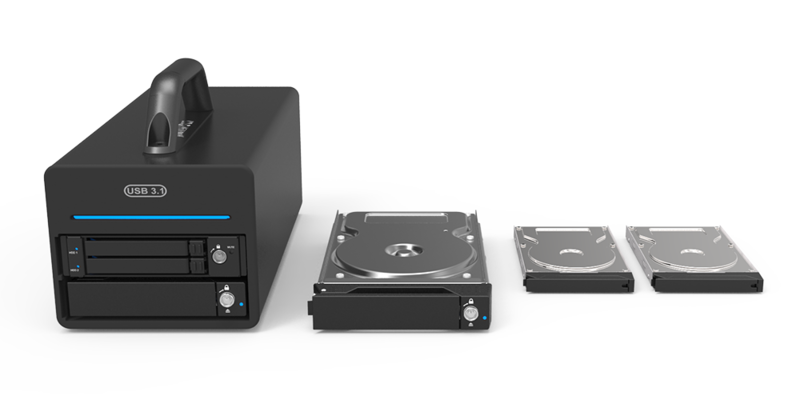 And you could install two 2.5" SSDs into its two 2.5" bays (RAID 1 mode) to enjoy its high data transfer efficiency and the data protection features. Its excellent data transfer performance, data protection, and the easy memory space expansion are the three main key features from DR3-B31 for you. Its hardware RAID 1 feature keeps an excellent data transfer efficiency for you even though it is doing the Rebuilding work. And this RAID 1 feature meets the requirements from your enterprise application. According to the strict restriction at RAID, any improper extraction at the HDD/SSD may cause a serious damage to your data. 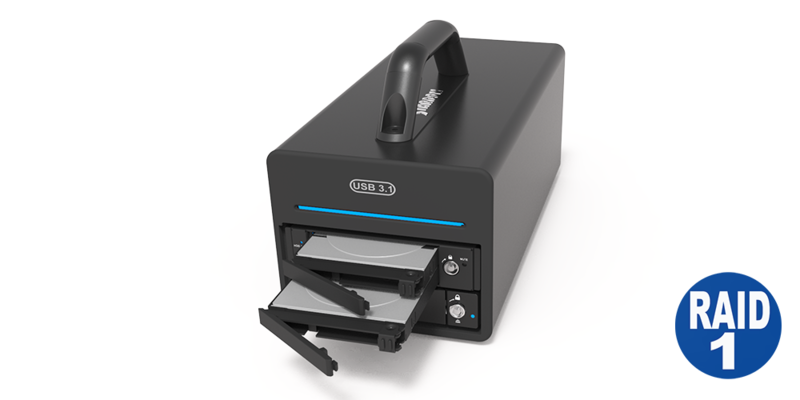 And DR3-B31's new Tray Lock design is to protect your data from any improper Tray extraction. DR3-B31's MCU feature helps monitoring its in-chassis temperature and alerting you while it is over-heated. While its in-chassis temperature rises up to 55 degree-C (131 degree-F), MCU will bump up the 4 cm fans with its full speed; and once it goes down to 50 degree-C (122 degree-F), MCU then drives down the fan speed to 70% for a better a better green user's environment for you. Or you could also manually adjust fan switch at it rear plate, MCU would then keep its fan with only 50% for an even lower fan noise and lesser power consumption. DR3-B31 not only supports the in-chassis over-heated but also the fan failure alarm too. It’s front power light will then be changed from blue to the blinking purple color, and its buzzer starts beeping to warn you that its fan parts might be defect. In case if your DR3-B31 still works fine, you could also turn off its annoy beeping by pushing its MUTE Switch which is also at the rear plate of the product. 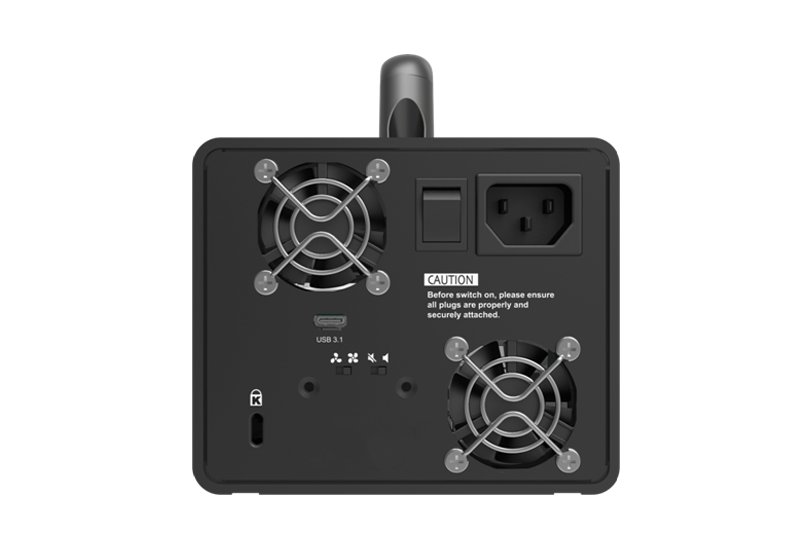 DR3-B31 uses conform with safety regulation certified 60W power supply unit which provides a stable and high efficient power output and definitely satisfies the big power consumption from all HDDs. DR3-B31's extruded aluminum material with our fine sand-blasting finishing work gives a seamless, sleek design and provides a very rigid structure to protect your data. And its rigid chassis could let you carry it around to different desks for different works. And its aluminum material helps an excellent heat dissipation which the heat is generated from your HDDs. Its sleek and stylish exterior design catches your eye-sights even though you put it right beside your Mac. 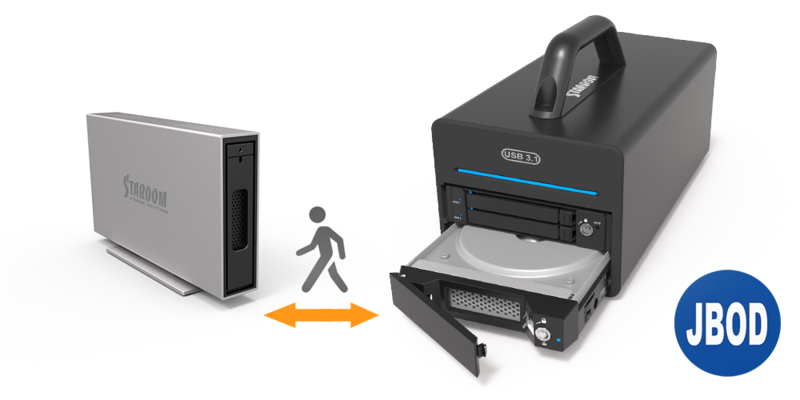 Its chassis is made by a thickness extruded aluminum material which provides you a good protection at your HDDs/SSDs from its rigid chassis design and its efficient heat dissipation. 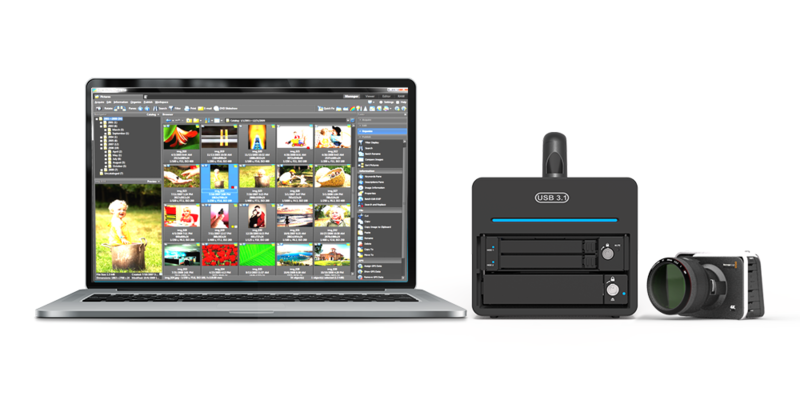 With one ultrafast USB 3.1 Gen 2 port, you can build a photo studio around Macbook Pro and DR3-B31. Or take them with you and import thousands of RAW images on location. Once your photos are on your computer, editing in Aperture is faster and more responsive than before. 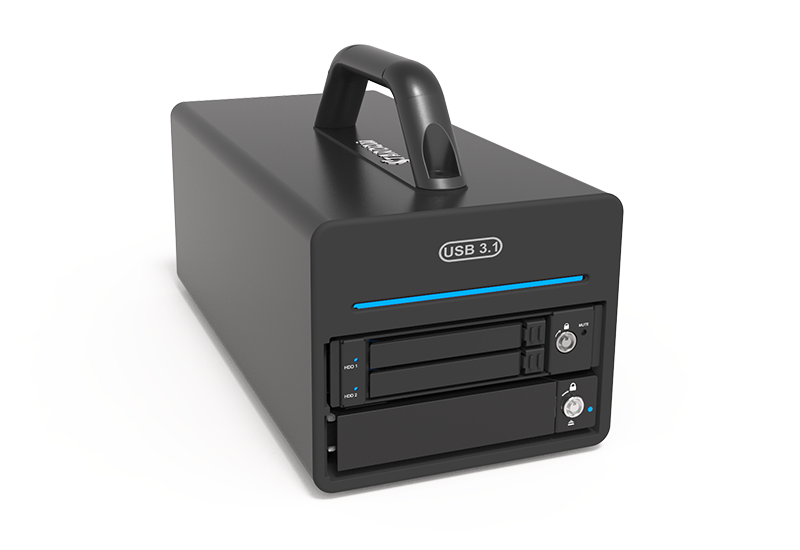 DR3-B31 JBOD + RAID 1 mode, you can store your important data in a RAID 1 mode, so that your data own dual security features. 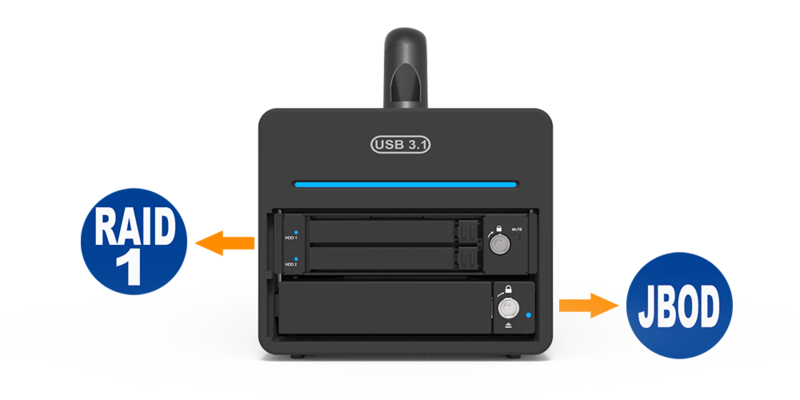 In addition JBOD mode of DR3-B31, you can use JBOD has data portability features to move your stored data.